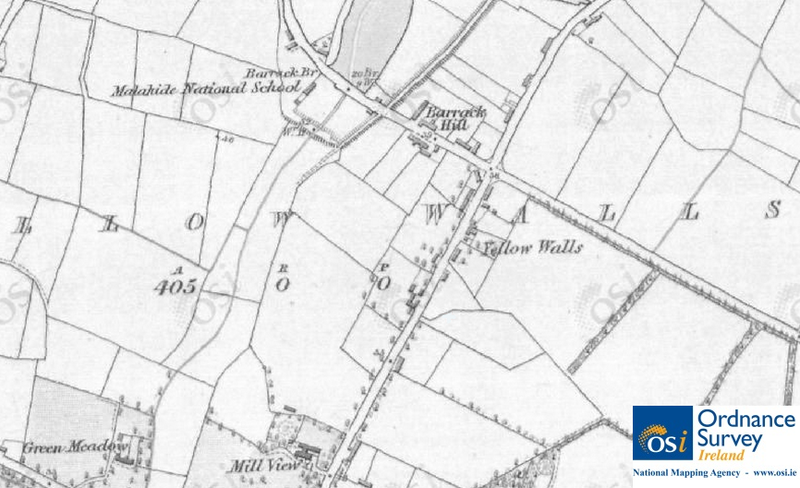 The origins of a townland name usually refer to a prominent landmark in the local area such as a village, church, fort or wood3, or in the case of Yellow Walls, possibly to a local industry carried on there. While some townlands were created after the Norman invasion of 1169, the majority have names derived from the Irish language, indicating more ancient origins. The boundaries of the Yellow Walls townland are shown in the maps below. The property of Lord Talbot. 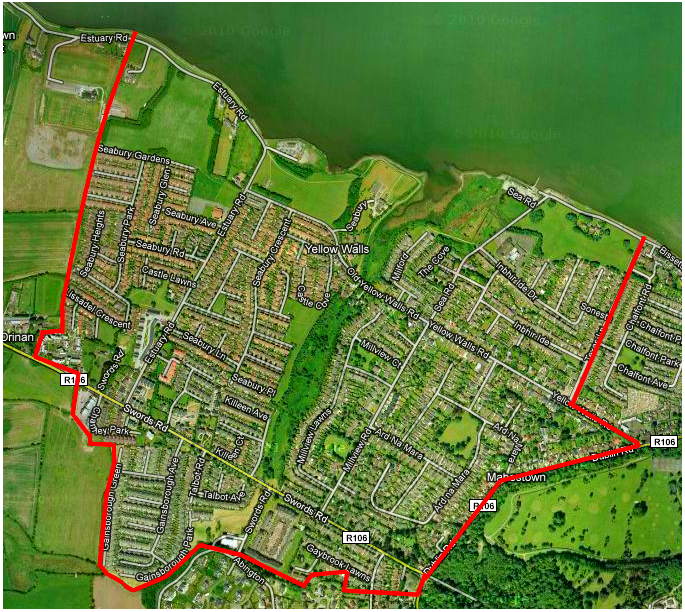 Contains 404 A (acres), 3 R (roods), 39.854 P (perches) (besides 2 islands 2 A, 0 R, 7 P in extent) including 21 3/4 acres of Demesne and 4 1/2 acres of Plantation not in the Demesne. The highest rents are £6 – leases for 21 and 31 years. The farm produce is wheat, oats, barley and potatoes. The townland is closely intercepted by roads which are kept in good repair. In the S (south) part of the townland on the S side of the road from Swords to Malahide is Gay Brook house and on the N side are Green Meadow, Millview and La Mancha houses. In the N part is a National School, the average attendance is 45 all males of the Protestant religion – it is supported by subscriptions and by the Board of Education. Other townlands bordering Yellow Walls include Auburn, Drinan, Malahide Demesne (which includes Malahide Castle), and Malahide itself. *This map can be accessed at the UCD Digital Library and is entitled “Map of the Environs of Dublin, / Drawn and Engraved under the Superintendence of the Society for the Diffusion of Useful Knowledge”. 1. Parliamentary Notices, The Freeman’s Journal, November 15 1872. 2. Twelfth General Report from the Church Estates Commissioners; with an Appendix. 1863. 3. Mitchell, Brian. A new genealogical atlas of Ireland. Genealogical Publishing Company, 2002. 4. Ordnance Survey Of Ireland, Public Map Viewer [online]. 5. 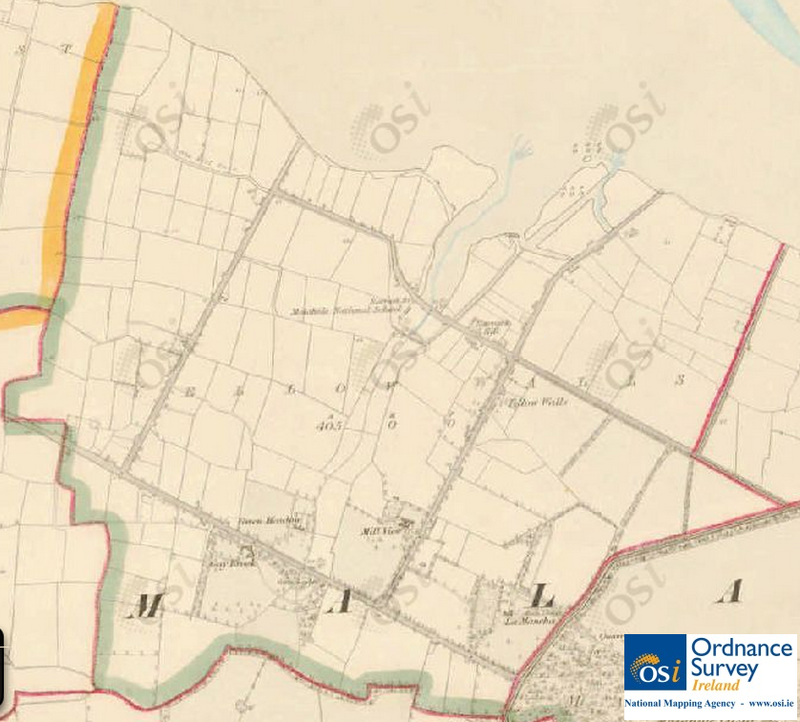 Ordnance Survey Of Ireland 6″ Map [online]. Reproduced under licence from Ordnance Survey of Ireland; Licence No. NE 0000414. 6. Pedder, James. The farmer’s land-measurer: or, Pocket companion, showing at one view, the content of any piece of land from dimensions taken in yards; with a set of useful agricultural tables, 1853. 7. 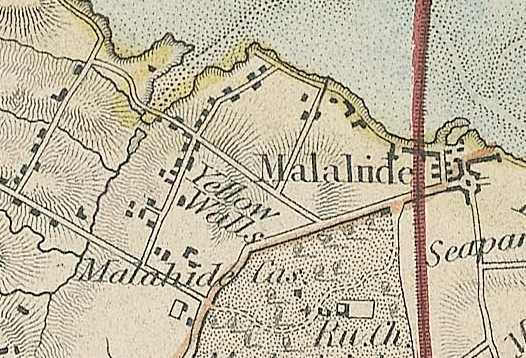 Ordnance Survey Field Name Book: Malahide, County Dublin, 1836.